Product prices and availability are accurate as of 2019-04-19 20:24:39 PDT and are subject to change. Any price and availability information displayed on http://www.amazon.com/ at the time of purchase will apply to the purchase of this product. Designed for the gardener who wants to enjoy the benefits of gardening, without the frustrations. FOR THE COST OF ONE SIMPLE GARDEN TOOL, you can OWN THE MOST VALUABLE GARDEN TOOL OF ALL ~ one that will save you money and help you learn from experience. Even more valuable than your favorite garden trowel or spade is a written record of what works in your garden. WHILE GARDENING BOOKS, APPS AND THE INTERNET ARE FULL OF GREAT ADVICE, THEY CAN'T REPLACE PERSONAL EXPERIENCE. Your garden is in your micro-climate, with your soil. Perennials in one part of the country aren't perennials in another. There are simply too many plants and too many variables for anyone to remember from year to year what worked where and what didn't and why. You need to remember WHAT WORKS FOR YOU--IN YOUR GARDEN. Every gardener faces repeat attacks of pests or disease and needs to remember which treatment worked and which did more harm than good. Every gardener has weeded out emerging perennials, forgetting what they planted where. Every gardener needs a memory! Please STOP here and consider your needs: If you want options in your methods of recording, this is the journal for you! 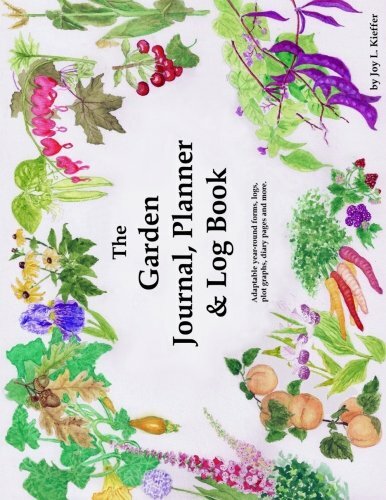 If you want a simpler garden journal, please click on the author's name and check out the smaller version, entitled The Garden Diary, Journal & Log Book. It has the same charts and helpful recommendations, but only three basic forms to fill out. 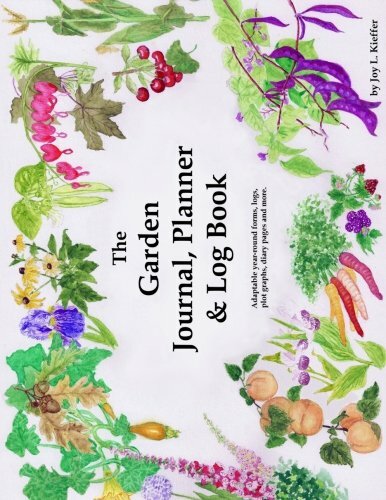 THE GARDEN JOURNAL, PLANNER & LOG BOOK is a book of garden forms with the flexibility needed to personalize your style of record keeping. With this one book you can track your purchases from store to harvest to propagation. What really makes the difference between a great and a mediocre garden is how well the gardener keeps track of all the information needed to enhance success and avoid repeated failures. GARDENING IS AN ART, BUT IT'S ALSO A SCIENCE. Individual plant pages with over fifty possible check boxes for each plant, plus space for additional info, photos, drawings, seed packets or tags. Logs for annuals, biennials and perennials, with code, location and date planted. Logs for weather, formulas & recipes, pests and diseases, cultivation and propagation, bloom and harvest times, flowers, bulbs, fruit, vegetables, herbs, vines, shrubs, trees, wildlife sightings and hardscaping. Prune, trim and tidy logs with guidelines. Planning pages for up to four years. Draw out garden plots for twenty beds on graph paper with notes on the pages opposite. Keep a diary for all the things you simply must write out using sentences or drawings, because as much as gardening is a science, it is an art above all. is the science behind your success.